First The Versatile, then The Dearest and Now The Inspirer! 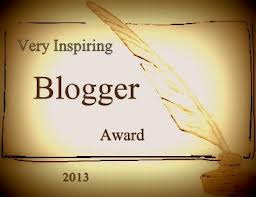 Aunt Mary at Easy Way (A Blog For Children) has awarded me 'A Very Inspiring Blogger' Award! Aunt Mary's Blog - Though the blog claims to be for Children, it definitely holds a lot of lessons that grown-ups can learn too! So if you haven't visited it already, go ahead and click! 1. I really did enjoy this reaction from Jennifer as Seth sings "We haven't seen Jennifer Lawrences' ** at all!" lol. 2. And no, I don't feel sorry for the Hollywood ladies who were mentioned in The Oscar Song. It's 'You-have-it, You-flaunt-it. They-see-it, They-mock-it' policy! These are blogs I would never miss reading! I hope you all enjoy them as much as I do. As you must have guessed already, of course there are rules! 2. and take a nice holiday! Shainee, thank you! I am sure your life is an inspiration to many gals out there! Thank you Aunt Mary for the honor! Congratulations, Nina - well done and well deserved. Hey, I just noticed that Kate at Home is not on the list above!! I could have sworn I put it there! its basically my entire blogroll, so am just stumped! Thank you, Epsita. Yours was the first award that I received and it has been a great journey since. So Thank you! Thank you izdiher! I just visited your blog. Kinda direct from heart blog. Loved it! This is a very much deserved award, Nina! You, and your blog fill the place of friendship and good reading we need in the world! And thank you for naming my blog. You never forget me! And I appreciate that! Your rules are astounding and the epitome of originality! You are being very kind, thanks! How can I ever forget the one and only Od Liam? Big Congratulations on your award Nina. You truly deserve it and I hope you get many more. Thank you for nominating me to, I was surprised to just see my name when reading, so thank you. I've also noticed that we both read very similar but good blogs and they are on your list too, so congrats to all of them for being such good reads. yeah we could thank Bloggers for ending up with the same reading list. 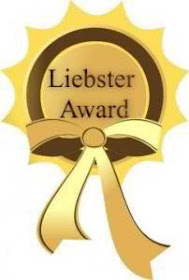 Thank you so much for the nomination and for visiting my blog today. I'll make a point of visiting all the blogs you have nominated. Yes please visit them, I am sure you will not be disappointed! Trust me, I have just saved you from becoming a landmark to fellow hikers! I really like the layout of your blog, it looks so nice. I came back just to admire the design, it's really interesting. Haven't done much really though..It's the Awesome Inc. Template on bloggers. wowowow :D Congratulations on your nomination Nina !!! God when I saw my name listed I went "BAZINGA" ehehh Thank you very much indeed :) made my day! Glad I made your day! !